Who Dat Say We Gona Paint the Saints? Do not miss the main event at Painting with a Twist in Slidell this week. They will be painting the Saints to the Superbowl. Who would have known the Saints would be in the Superbowl playing against home town football star Payton Manning and the Colts? If you are like the rest of us and you can’t get enough of the Saints then you must come and join in the celebration. 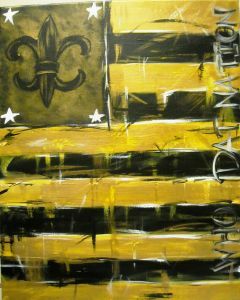 They have picked the painting and it is all about the Who Dat Nation. So put on your black and gold and grab a bottle of wine because it is Who Dat Time! This is a painting that you will wish you painted more than one of. This is the first time they have featured this painting at Painting with a Twist in Slidell and they are saying because of the great response that they will have to do it again and again and again. They credited this hype to not only the greatest team in the NFL but also because of the greatest fans on earth. The Saints and the Who Dat nation have electrified this city and the only way we can capture the moment is to paint the town black and gold. So do not miss this event. If you do then contact the store and request that they do it again. 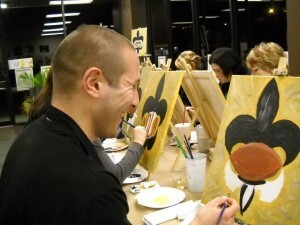 If you are a newbie here and you have never heard of Painting with a Twist in Slidell then check it out. It is the latest craze in the arts and entertainment world. It first started in Mandeville and is now sweeping the country. It is for all those people who love to paint or who would love to paint. It is fun and easy and it brings out your creative side. To book the Saints event right away just visit there calendar here at Painting with a Twist in Slidell. When you locate it on the calendar just add it to the cart and checkout. You will then need to fill out the reservation form and make payment to secure your spot. That is it! Who Dat! This entry was posted on Tuesday, February 2nd, 2010 at 8:47 pm	and is filed under Events. You can follow any responses to this entry through the RSS 2.0 feed. You can leave a response, or trackback from your own site.